Evening friends! I hope you are all enjoying the beginning of spring! Easter is quickly approaching, I can't believe it, the time just flies!!! I wanted to share this cake with you. I admittedly am not a fan of lemon in a savory sense, I can stand it in a sweet application but at the same time lemonade is my favorite beverage. Go figure right? If you say lemon pepper, I immediately want to gag, and if you mention lemon meringue, I gag twice. It is so tart, so strong, so overpowering to me. BUT.....not this cake. This cake is my dream lemon cake. We have a sweet lemony creamy flavor. Nothing to strong, but definitely lemon. I thought it was a perfect cake for spring, or an Easter dessert. I intended for this cake to be 4 layers, but, a small catastrophic even occurred and it ended up 2 layers. Feel free to divide those babies and make it 4! There aren't many textures that have been left out of this one, and the crunch cookies just make my day man, they, make....my....day! It is funny how when you don't like something you don't use it a lot for baking or cooking. I noticed I wasn't pleasing any lemon loving readers and I needed to give you some love. With that said, I hope you give it a try and enjoy it as much as I do! This is written out a bit odd. I feel like it is a bit of an odd day and it appears to have translated in my post. I broke it down into the cake, the filling and the icing as far as directions. So you will have to see under each, what ingredients you will need. Enjoy a lemony great day! Follow the directions on the cake mix, plus adding the pudding powder. Mix until combined and pour half into each of your well greased, 9 inch round cake pans. Bake according to package suggestions and then leave to cool for at least 30 minutes. In a bowl combine pudding and milk, mix until smooth and combined. Stir in about 10 cookies, crunched up into chunks. Or you can put them on top of the filling. Mix until combined and then set on medium speed of your stand or hand mixer and let it rip for about 3-5 minutes. Take the rest of your lemon sandwich cookies and place into your food processor and process until they are fine crumbs. You can also place them in a sandwich bag and use a rolling pin to get them into fine crumbs. You want FINE crumbs, trust me. Place your first layer of cake on your cake plate or serving plate. If it is really domed on top you can trip the dome off. Spread your pudding filling on top and then sprinkle over the roughly chopped cookies. Or if you combined them, spread the whole thing over. Place your second cake, domed side up on top. Start icing your cake. I like to put a lot on top and work it down the sides. You don't have to worry about perfection, as we will be covering the entire thing in cookie crumbs! Place your crumbs on a large baking sheet, take some in your hand and carefully press them into the sides and top of the cake. You have to find what works best for your. You can always clean the crumbs off when you are done but give them a good press into the icing. 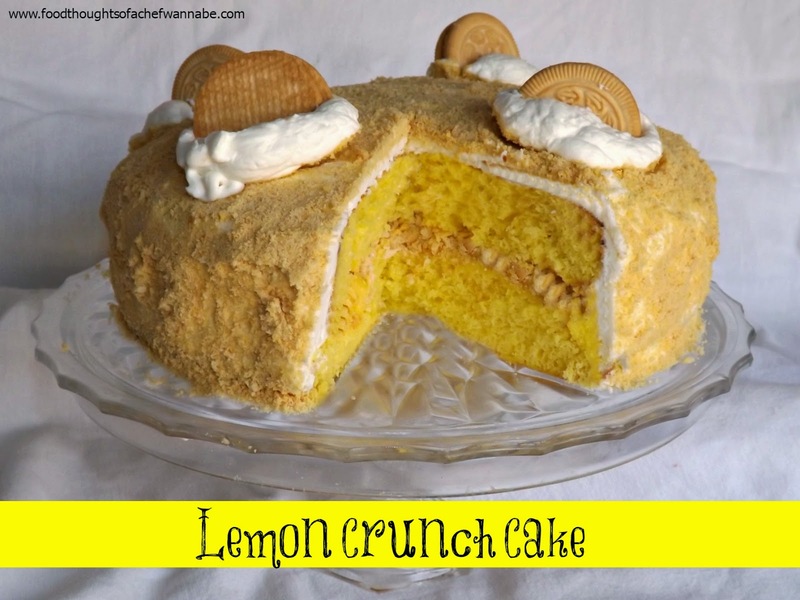 When you have covered the whole cake in crumbs, feel free to leave it as is, place a lemon twist or slice on top or use a few cookies and some fresh whipped heavy cream to decorate the top. The choice is yours! Good evening friends! I hope this finds you well, happy, and enjoying life! The weather here has been INCREDIBLE and to say spring has sprung is like the understatement of the year. I hope we get no more snow, although we have had only about 5 inches total this winter. It has been in the 70's, 2 days in a row now. I am sure the tulips are just dying to pop up, because I sure am! I wanted to try a recipe from a very old church cookbook that inherited recently. When I say old, I can only read a few recipes, and most don't have temperatures or amounts of time to cook things. I find this fascinating and I found a recipe I knew would be well received by my husband and kids. It looked easy, and, I could actually read it!! There was no mention of the size of pan to use, but go with a 9x13. I also suggest letting cool completely and then putting in the fridge for an hour or more. Mine was in overnight. Then, if you want it warmed up you can do so when serving. 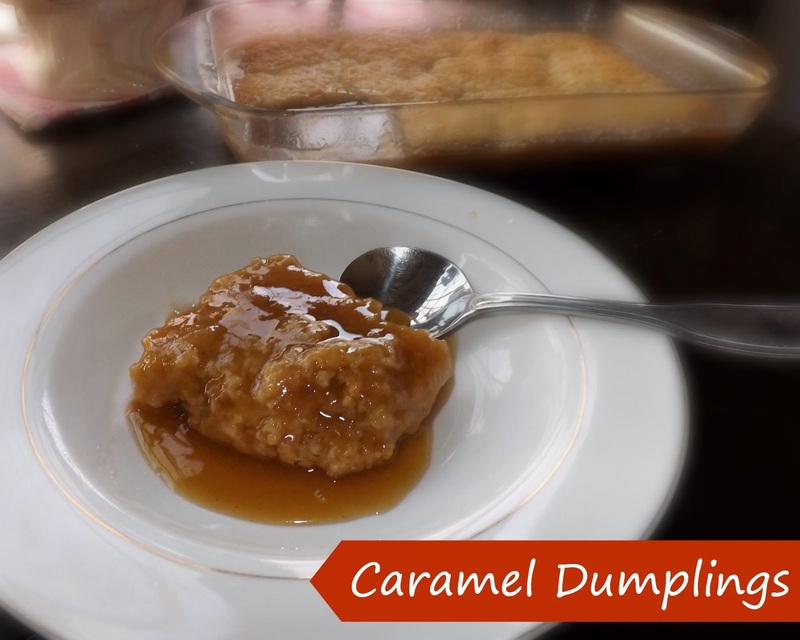 Make sure to add a big scoop of ice cream or whipped cream to the top of this baby and then drizzle plenty of caramel sauce on top, because there is definitely plenty to go around! Add all ingredients into a pan and heat until all of the sugar is dissolved. Then keep on warm and prepare batter. Preheat oven to 350 degrees F. Cream the sugar and butter together. Sift in baking powder with flour and add milk and flour alternately to the creamed mixture. Pour syrup into 9x13 pan. Using a medium scoop or a spoon drop the batter into the syrup. Bake for 30-40 minutes. This will depend on how big your dumplings are. Mine took 35 minutes. Let cool completely, and refrigerate for at least 2 hours. When you serve if you want it served warm reheat in microwave or oven for a few minutes. Go ahead, get a towel for your drool. This is going to be a good one. 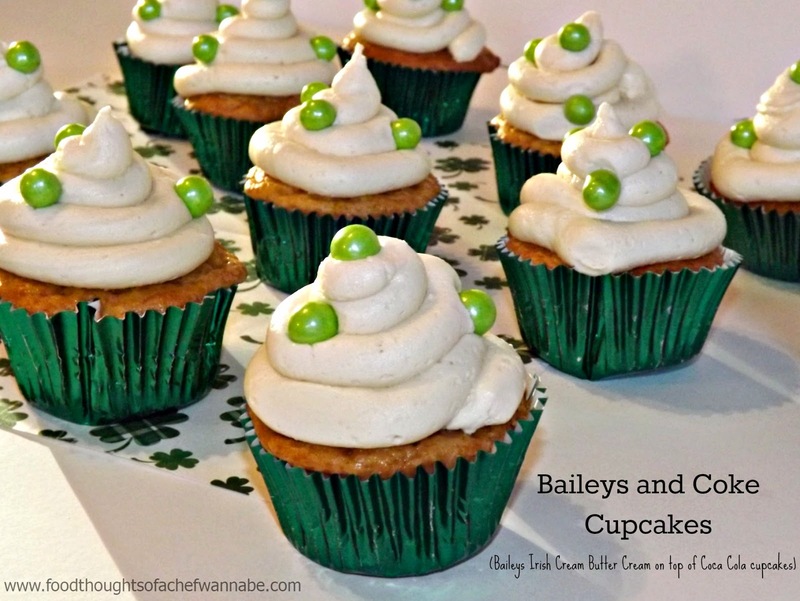 I always like doing something with Irish Cream for St. Patrick's Day. It is the birthday of one of my dear sisters, (Holla Patty), and a day full of food and drink traditions! I was reaching, grasping, and being tormented by what I would make this year. Then, a few days ago it came to me. I drink Baileys and Coke all the time, why not.....oh wait, let me clarify. The 5 times a year I have a drink, I get on with my Baileys and Coke. When I used to travel, it was the best drink the airlines could make me, and while, it does look a little unappealing before being mixed, it is delicious and if you haven't tried it you should. I know!! Maybe these cupcakes are a good way to try it out first! Really these are so easy, so fun, and quite honestly, quite freakin amazing. May the luck of the Irish be with ye! Preheat your oven to the temperature recommended. In a bowl mix together your white cake mix and the Coke. Line your cupcake tin with papers and scoop even amounts into each. Bake for the recommended time. Remove and let cool completely. For the butter cream, in the bowl of a stand mixer or a mixing bowl add in butter and powdered sugar. Beat until completely combined. Start adding a little bit of Irish cream at a time until you get to your desired consistency. If you are using a stand mixer, let it rip for about 5 minutes. The secret, in my opinion to perfect buttercream is letting it whip for a long time. 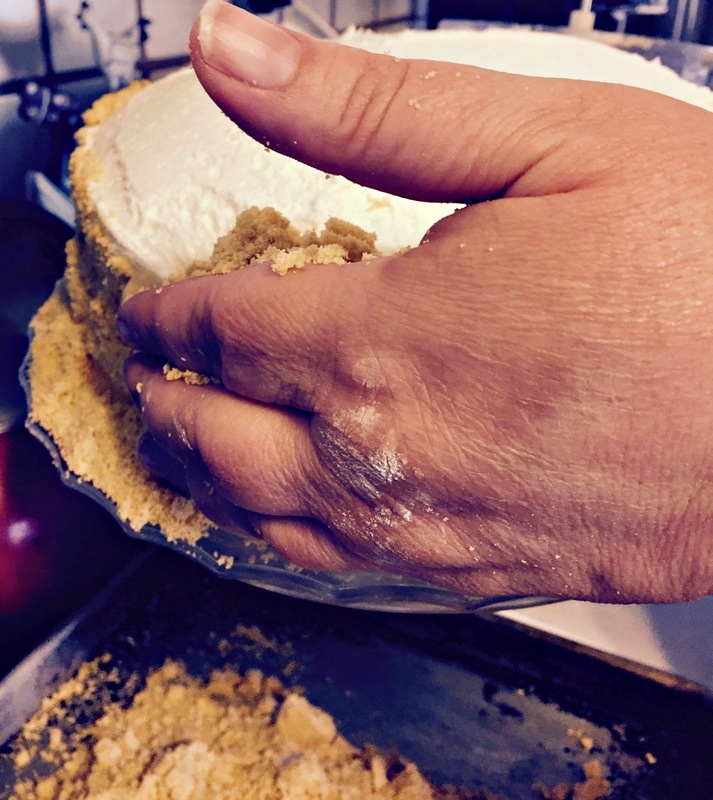 If you are using a hand mixer, just go as long as your arm still stays attached! Frost your cupcakes however you choose, and decorate as you like. Then, be prepared to get cupcake drunk! This one goes out to my sister Karen who has been requesting a corn chowder recipe. While I think I stepped outside the "corn chowder" box, it is fantastic She seemed happy with her outcome so it is time to share it with you. I wanted to get another soup or two in before winter passes us by. Soup is my love, well, George is my love.......well.......yea, its George for sure but soup is right up there! This is just a basic start to soup and then I added what I would want in a corn chowder. Tradition is probably thrown out the window here, since I am not sure what is involved in a true, traditional corn chowdah. HA, I wanted to type it that way this entire post. 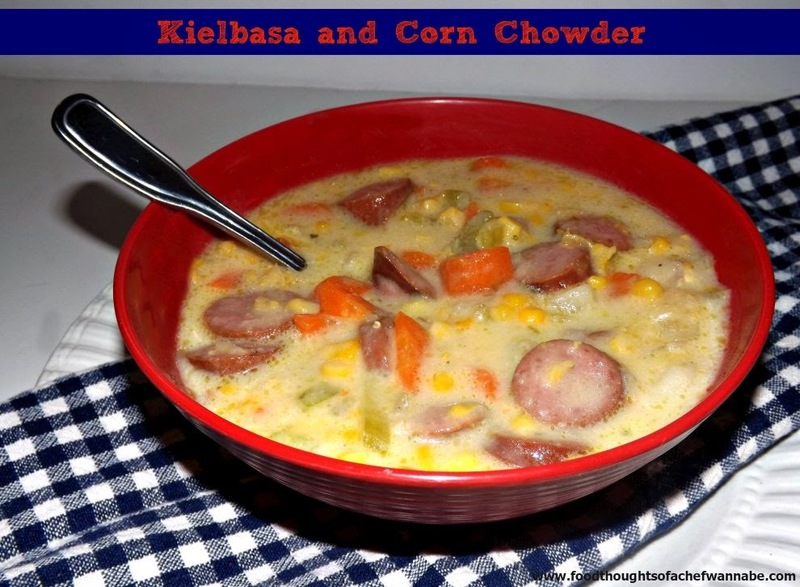 I liked the smoky kielbasa, I am not a huge potato in soup fan, so I went easy on that, feel free to double the amount of potato, but, I am here to tell you this is pretty damn awesome as it is. Ok I take it back, try it my way first then the second time, because trust me, there WILL be a second time, make it your way. Now get up off of that thang, and get cooking! In a large pot, melt butter and oil and then add carrots, celery and onion. Stir for 5 minutes, until your veggies begin to soften. Add in potatoes and sausage. Stir and let sauté another 2-3 minutes, stirring often. Add in corn, and stir well. Add in chicken stock, creamed corn, and half and half. Let simmer uncovered for 15 minutes. Add salt and pepper to taste. Remember the sausage is salty and the stock can be depending on the variety you use. Enjoy a hot bowl of this with a piece of crusty bread and butter. Oh YUM. Hello friends! I am finally back on my game! WOOHOO! I hope you are all doing well. I have been busy in the kitchen, just doing a lot of testing, tweaking and tasting! I just have been keeping it from you, I guess. Life got hectic, good and bad. I am back and ready to roll out some more great food! Brownies or blondies? Which do you prefer? What if there is a chocolate in a blondie or blondie in a brownie? The struggle is real people, the struggle is real. I love both and I will admit, I am still on a bit of a "use up". I way over bought at Christmas and then there was clearance from Valentine's Day and well, the cupboards are jam packed. This recipe is a little of this and a little of that. I started it based on another recipe I have and then 2 tries later, I got it. I did it, thank the good Lord above because someone has to eat these misadventures and it can no longer be me! 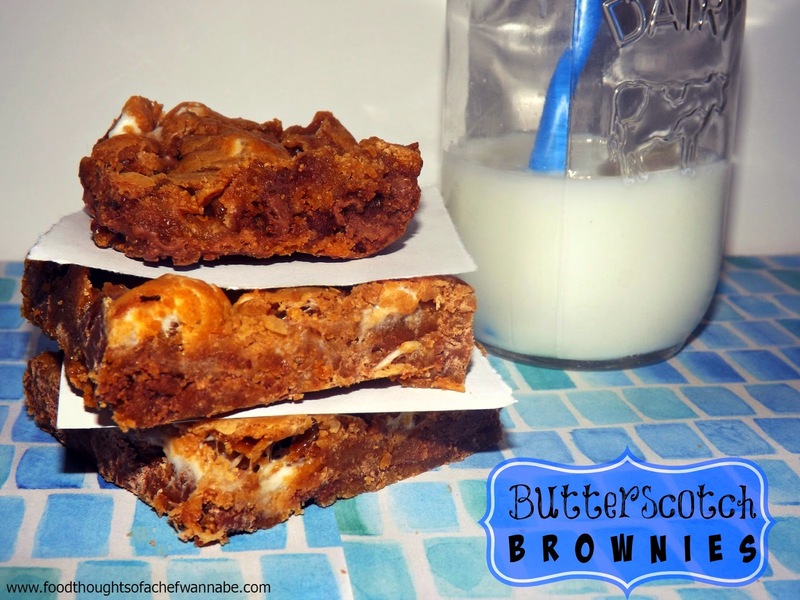 These have something for everyone, chocolate, butterscotch, marshmallows, and toffee! They are chewy and the perfect brownie/blondie consistency in my opinion. I don't like hard and crunchy, I don't like raw, these, are chewy and soft, and oh so yummy! Give them a try! 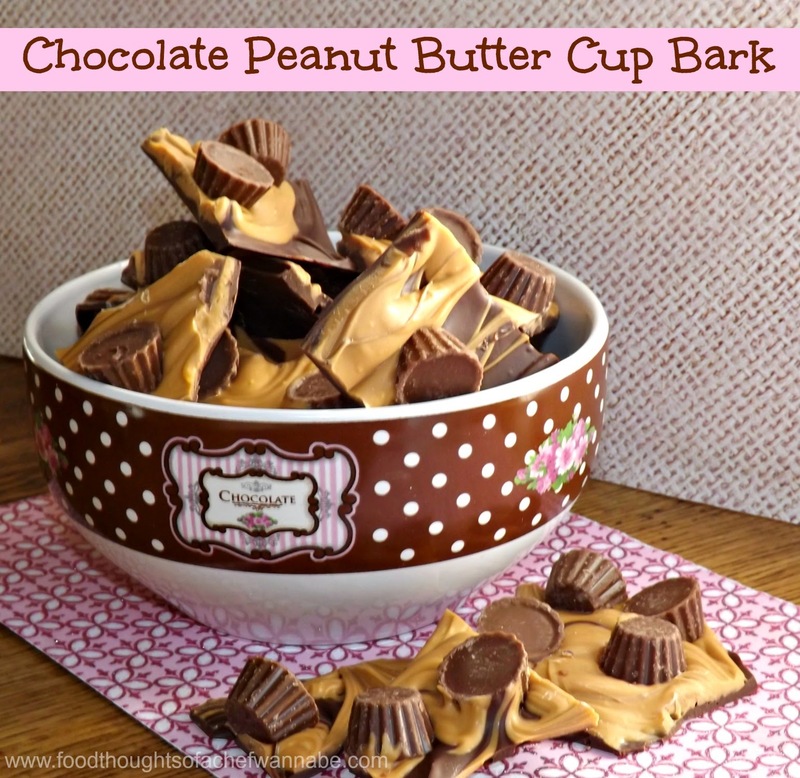 Preheat your oven to 350 degrees F. In a heavy bottom saucepan, melt together butterscotch chips and butter stirring constantly. Remove from heat and let cool until it is just warm. Add in flour, brown sugar, baking powder, salt, vanilla and your egg. Mix well! Let cool for 5 minutes. Stir in marshmallows, toffee bits, and chocolate chips. Fold just until combined. Place into a well greased 9x9 baking dish. Spread evenly and back 20-23 minutes, the center should still be a WEE BIT jiggly. It will set as it cools. Don't over bake or you will get dry and hard brownies! Enjoy these! I like putting them in the fridge, because I like them cold. I like all brownies refrigerated. Freaky fact I guess. 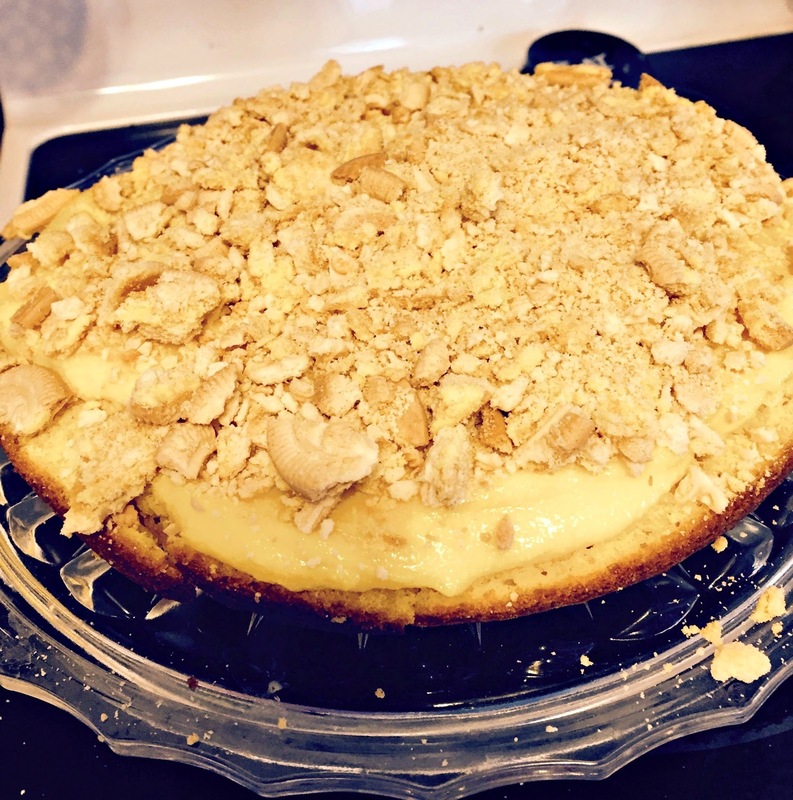 Let's put it out there straight away folks, this recipe was my husband's brainchild. It "came to him in a dream". Who am I to argue with the subconscious mind? I just thought it sounded good, and when we hammered out the deets, well, this is what we got. It really is delicious but there are a few things you should know about this little beauty. This is done in about 30-40 minutes. Easy, peasy, nice and cheesy! 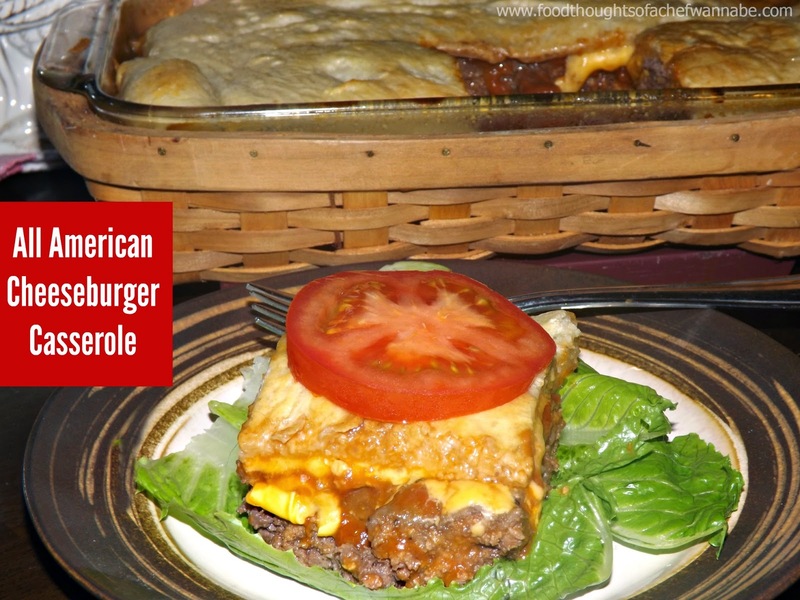 You can use whatever kind of cheese you like, I used American cheese. This is basically one big cheeseburger with only a top bun, and everyone can dress it up how they like it. Lettuce, tomatoes, pickles, onions, and maybe even...wait for it....waaaaiiit for it...........BACON? This is sure to please everyone and the burger has great favor. So thanks to my husband, you are going to enjoy this as much as we did!! There are a couple of steps, nothing major, just steps that need to be taken for maximum, yumminess! Bake for 20 minutes and remove from the oven. This is the point where, if you used ground beef with a higher fat content, take the flaming hot casserole dish to the sink and tip out the fat into the sink. Sounds so gross, but just do it, trust me, it will be better in the end! If you in fact used very lean ground beef, there should be no worries. Now take your sauce and cover the top. It isn't uncommon for the meat to pull away a bit if there is a lot of fat in it, from the sides. No problem. Now, cover the top with your cheese, on top of the sauce. Whisk an egg up and add a splash of water, brush the top and throw this puppy back in the oven for about 15-18 more minutes. Make sure that crust isn't gooey in the middle and is golden brown deliciousness all over! Let cool for 5 minutes before cutting. Make sure to have a bounty of sides to add to your piece of "cheeseburger"!!! It was a hit at my house and I hope it is at yours as well! !